»AltaVista was created by researchers at Digital Equipment Corporation's Network Systems Laboratory and Western Research Laboratory, who were trying to provide services to make finding files on the public network easier. Paul Flaherty was responsible for the original idea, and two key participants were Louis Monier, who wrote the crawler, and Michael Burrows, who wrote the indexer. The name AltaVista was chosen in relation to the surroundings of their company at Palo Alto. 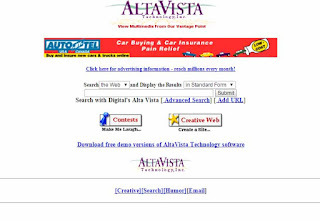 AltaVista was publicly launched as an internet search engine on December 15, 1995 at altavista.digital.com. At launch, the service had two innovations which set it ahead of the other search engines: it used a fast, multi-threaded crawler (Scooter) which could cover many more Web pages than were believed to exist at the time and an efficient search running back-end on advanced hardware. As of 1998, it used 20 multi-processor machines using DEC's 64-bit Alpha processor. Together, the back-end machines had 130 GB of RAM and 500 GB of hard disk space, and received 13 million queries per day. 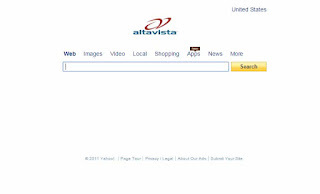 This made AltaVista the first searchable, full-text database of a large part of the World Wide Web. 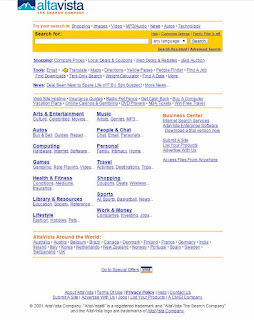 »In 1996, AltaVista became the exclusive provider of search results for Yahoo!. In 1998, Digital was sold to Compaq and in 1999, Compaq redesigned AltaVista as a web portal, hoping to compete with Yahoo!. 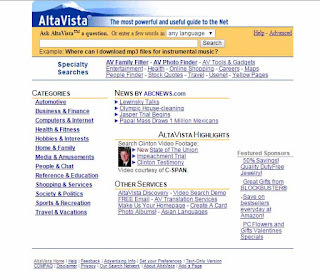 Under CEO Rod Schrock, AltaVista abandoned its streamlined search page and focused on features like shopping and free email. [...] In June 1999, Compaq sold a majority stake in AltaVista to CMGI, an internet investment company. CMGI filed for an initial public offering for AltaVista to take place in April 2000, but as the internet bubble collapsed, the IPO was cancelled. Meanwhile, it became clear that AltaVista's portal strategy was unsuccessful, and the search service began losing market share, especially to Google. 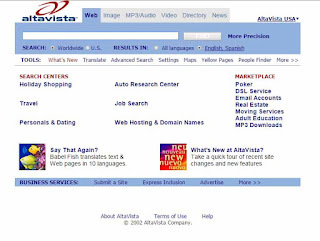 After a series of layoffs and several management changes, AltaVista gradually shed its portal features and refocused on search. 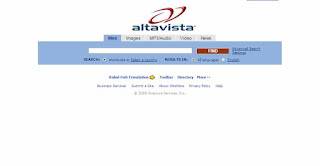 By 2002, AltaVista had improved the quality and freshness of its results and redesigned its user interface. In February 2003, AltaVista was bought by Overture Services, Inc. In July 2003, Overture itself was taken over by Yahoo!. Source: youtube: Asking AltaVista in 1996 - This video show how the AltaVista search engine worked in late 1996. How queries could be presented in simple and advanced mode, and how reults were displayed.